The region of Fronsac is known in Bordeaux as the ‘Secret Garden‘. Perhaps this is because it is not only one of the most picturesque of the wine regions but also because the wines are largely undiscovered by the world at large. Their close neighbours are the famous UNESCO territory of Saint Emilion and the world renowned tiny Pomerol vineyards. Mentioned by the Roman poet Ausonuis, it is part of the early Gallo-Roman vineyards of Bordeaux. Travelled since the 8th century, one of the major routes of the Saint-Jacques de Compostela still carries pilgrims and hikers across the hills and through the vineyards of largely family owned chateaux. The two appellations of Fronsac are Fronsac to the north and Canon Fronsac in the south at the confluence of the Dordogne and Isle Rivers near Libourne, known as the ‘other wine capital’. Producing mainly merlot based wines, the vineyards are relatively small averaging only 10 hectares. They are neatly manicured on central plateaus and hills on the clay and complex clay-limestone slopes. This soil is called the ‘Fronsac Molasses’ and is also shared by the neighbouring appellations of Saint-Emilion. But Fronsac’s protected position sometimes gives Fronsac and particularly Canon-Fronsac some very special wines when other neighbours have suffered extreme heat in a growing cycle. La Confrerie des Gentilshommes, or The Brotherhood of Gentlemen, are a group of men and women of the Fronsac wine area who are elected by their peers as ambassadors and guardians of the Fronsac wine and reputation worldwide. Their position is important to the community and wearing red gowns and caps they carry a medal with the embossed image of Marshal Richelieu, Duke of Fronsac. They preside over special occasions such as the main event, the "Gerbaude" in October, the traditional celebration marking the end of the wine harvest. 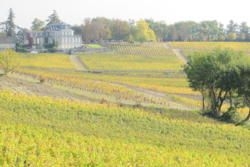 In the 18th century the chateaux of Fronsac produced the most popular and expensive wines in the Bordeaux area including that of Saint-Emilion and Pomerol. They were the favourites of the king and the Versailles nobles alike. However, during the 19th century the Fronsac vineyards suffered the devastation of several vine diseases, particularly phylloxera. It has been a long road back to their deserved recognition and though they are regaining popularity, as yet they have never recovered their former glory. The chateaux buildings still retain their striking architecture and many are preserved in their original state. 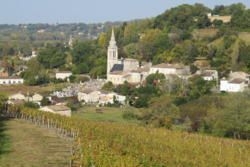 As Fronsac works hard to become better known this is still definitely a region for the traveler/winelover/hiker to explore in peace and find great value and affordable wines.